Walt loved music, so he planned a lot of it inside the park. 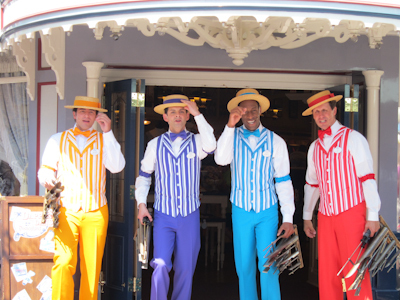 Much like the Pearly Band, Bootstrappers, Hook and Ladder Company, and the Straw Hatters, the Dapper Dans is a barbershop quartet who appear to perform for a short while and then disappear. 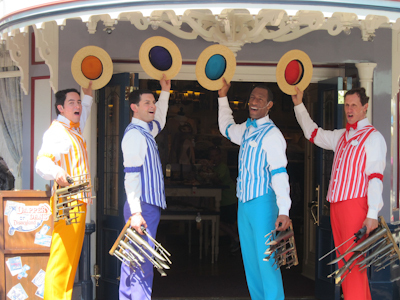 They sing a capella on Main Street, usually near the fruit cart. You can spot them by their natty outfits. They usually tap dance a little, but I didn’t quite catch that. I can’t emphasize enough that these roving entertainers really are a lot of fun and I recommend slowing down and seeing them when you’re at the park. The Dapper Dans have been around since 1959 and even have their own website. Apparently they’re supposed to have a custom 4-seater Schwinn bike, but I’ve never seen it. Even though they don’t have the Disney characters or flash like the Straw Hatters and the Hook and Ladder Company, they still excel in entertainment. That person on the left is clapping. 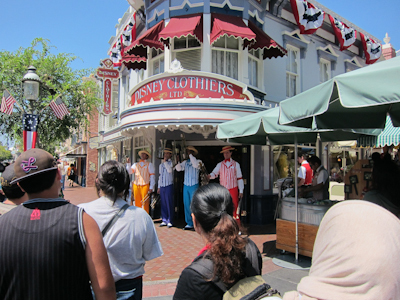 The Dapper Dans are really one of the most recognized of the roving entertainment. I didn’t know anything about the others, but I had definitely heard of the Dapper Dans. 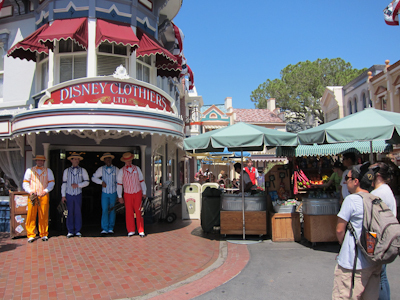 And when I asked the internet what the name of the Straw Hatters was, most people said it was the Dapper Dans. Except that a barbershop quartet only has four people. The Dapper Dans also has that little bit of flair so emblematic of Disneyland. Definitely try to catch some of the roving entertainment at Disneyland. It’s a lot of fun. 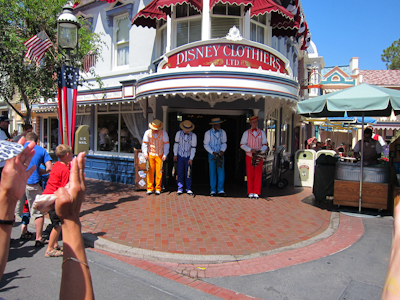 Whoa – The Straw Hatters and the Dapper Dans are two SEPARATE musical acts? I did not know that! *Mind Blown* I’ve been confusing them since – well, forever, really. in 1992, while visiting Walt Disney World, I saw the Dapper Dans riding their custom four-seater tandem bike slowly down Main Street, smiling and tipping their hats to the waving crowds. It was an experience that was much like seeing some famous icon–like The Oscar Meyer Wiener-mobile– drive by. I always thought that Disneyland’s Main Street was too narrow and crowded for such a bicycle. I enjoy watching the Dapper Dans perform. They always involve the guests and interact quite a bit with everyone. I also love that hand-held four person musical chime instrument that they are holding in the last two pictures in this entry. Four performers each hold two chimes to make a full eight note musical scale of eight notes. It takes a lot of coordination and practice to get any kind of reasonable sound. I love that they take requests, too. But if you see them enough times, you learn that there are only a limited number of songs that people request, either Barber Shop standards or popular Disney songs.